You place a retargeting pixel on either (a) certain sections of your site or (b) across your entire site. As visitors visit the pages you have the pixel on they are added to what is called an "audience." This audience is cookied and as they visit other sites in the display networks you are running retargeting ads on, they are shown your ads. The size of your audience greatly affects the success of your retargeting campaigns. Even if you aren't ready to start testing retargeting, I highly suggest you start building your audience. The larger this qualified group of past visitors, the better! You can also control the sites that show your ads, just like on typical display network buys. You can decide that a site isn't cutting it, and cut them from the list. You have quite a bit of control around who sees your ad and who doesn't. ** Since Remarketing really is a beast all it's own, I have decided to focus this post on just retargeting. If you want me to write a post on how to set up Remarketing, and how to use it effectively, let me know in the comments below and I'll get on it! Now that you have the gist of how it works, let's talk about practical applications for this marketing channel. The simplest answer to this would be to say that remarketing gets previous visits back to your site. We all know there are lots of conversions that can happen when you get a previous visit to return. Remarketing can be effective at every step of the funnel. You know what? I hate that we always call it a funnel. So today I'm calling it the buying ice cream cone. 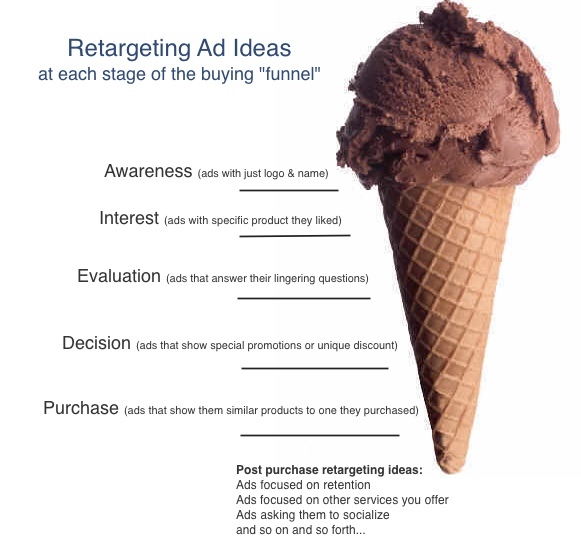 Retargeting banners can be effective at each step of the buying ice cream cone (see below). It is tempting to apply past display ad truths to your retargeting efforts, but this isn't your best decision Retargeting demands unique banner ads, custom landing pages, and ongoing optimization. So unless you have the time to truly research, learn, build-out, and measure another channel, you might want to hold off on retargeting. Like every other marketing opportunity out there, you can lose money if you don't put the time in. Not sure if "official" is the right word, but banner ads that are a bit more out there have huge potential on retargeting. These ads can be more personal, quirky or humorous. They need to catch a person's eye and trigger a memory of their last visit. Logos and brand names are still important, but retargeting ads are an opportunity to push your creative messaging. This is a chance to tell a story to a user that will continue to see you and interact with your site. Those are the biggest challenges we have faced here at SEOmoz. When we first started testing retargeting we were starry eyed with the initial results, and since then we have continued to be impressed by its performance. However, we have also made a whole lot of mistakes along the way. Our latest mistake was actually firing the conversion pixel on the wrong page (resulting in about 8x more conversions being recorded)-- yeah that really happened. So just keep in mind, this channel isn't a "set it and forget it" answer to your marketing prayers. I don't want to scare you off. Retargeting can be incredibly effective for advertisers that put the time in to manage and optimize spend effectively. I should mention that last month alone we saw 4X the number of free trial signups from retargeting than we did from a similar stand-alone site sponsorship. We actually ran identical banner ads for those two buys as well. The differences came in having a prequalified audience, and staying in front of our target audience. So take it or leave it, but the marketing team over at SEOmoz is definitely excited to play around with retargeting and see how creative we can get with the sequences of our ad buys and landing pages (I hope to get some follow-up posts with case studies for all of you soon enough). The results make it worth the time, and in my opinion, it's like the Wild West in there right now. You don't have to worry about competition like with many other channels, you control every piece of this channel, and you have unlimited options on how to utilize it.